Anyone who knows me, knows this. I have never quite figured out why I like it so much-- it is kind of slow, action is sporadic, usually rather long games-- but I do. I understand it better than I do almost any game I have ever played; my first job was keeping score for my brother's Babe Ruth League. Maybe that's why. I spent many a summer up in the score booth, deciding if someone committed an error or if it was a 1B of FC. Getting yelled out by grown men because they didn't agree with my decision. Being lauded by the cuties that benefited from my decision. (disclaimer: my calls were never based on someone I thought was cute, although it is tempting) I associate it with being the decision maker, with human subjectivity, with cute boys and hot summer days. I also think it provided one common ground with my dad when I was a teen. We didn't get along well at the time, but we could always talk about baseball. It was the one thing my grandpa could watch, complain about, enjoy when he was confined to his house or hospital room. It brings people together-- from the little kid who goes to his or her first game with the harried father buying everything the kid wants, to the adult child and parents who go to just enjoy and drink a beer or two. Soon after my grandmother passed away, we celebrated by grandpa's birthday in a skybox at the Oakland A's game. It was the first game he had attended since he had a stroke about 7 years prior. It was a coordinated effort-- he couldn't walk up and down all the steps and to and from the car, so we had to get a little assistance-- but it was worth it. We were all together, and he was happy. We sat in the front row of the box, ate popcorn and hot dogs and nachos and whatever other food we wanted, and watched Barry Zito pitch a hell of a game. 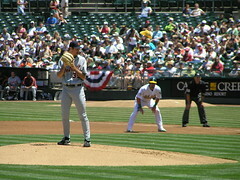 Unfortunately, he pitched so well, it was the shortest game in Oakland's history (up until then), way under 2 hours. But it was a fun time, and one I like to think my grandpa, and the rest of us, really enjoyed. I spent this last 4th of July holiday at the ballgame with my dad. We have spent several of these holidays together, bonding over the A's and how they are doing (depending on the season, awesomely well or incredibly sucky). We had a few beers, sat in the sunshine, and enjoyed the game. This year, it went into extra innings and we left at the end of the 9th inning, but the A's ended up winning. Watching it at home, we celebrated. Baseball.